The photograph above is from an evaluation of the C-5 product conducted with the City of Leesburg, Florida on Garbage trucks in 1992. These vehicles were selected because their work habits represent a worst case scenario (stop & go with high idle time). As part of the test, smoke reduction was documented by inserting a 25 micron filter in the exhaust gas sample hose. This allowed soot in the exhaust stream to be captured prior to interring the diagnostic equipment. The soot represents visible smoke. A new filter was installed at the beginning of each test segment. 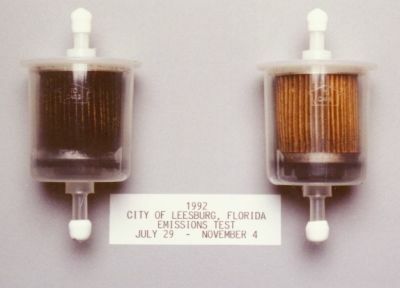 The baseline filter trap on the left was subjected to engine exhaust for fifty-one total minutes from five separate vehicles operating on untreated fuel. The treated segment filter on the right was subjected to engine exhaust from the same five vehicles for a total of fifty-four minutes. This side by side comparison shows the dramatic improvement normally associated with the use of FUEL-TEK products.